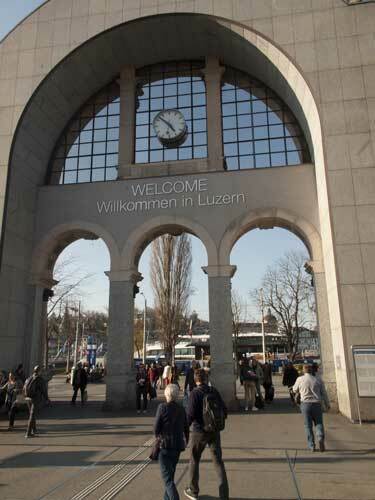 A nice sunny day at Lucern /Luzern. End of March, the nature is blooming again, and it is also time for me to attend to my first whisky event of year, the Whisky Schiff Luzern. They had the good idea of the opening the desk before the opening of the gate, so the wait at the gate was rather short. My first stop was at the stand of Jim McEwan, former distillery manager of Bruichladdich. He is now associated with Reto Stöckli, the new owner of Whisky Neumarkt in Zürich and they commercialise together the private casks of Jim, under the independent label “The Cask Whisperer”. My first dram was a very peated Octomore 2009 matured in ex-red wine cask. 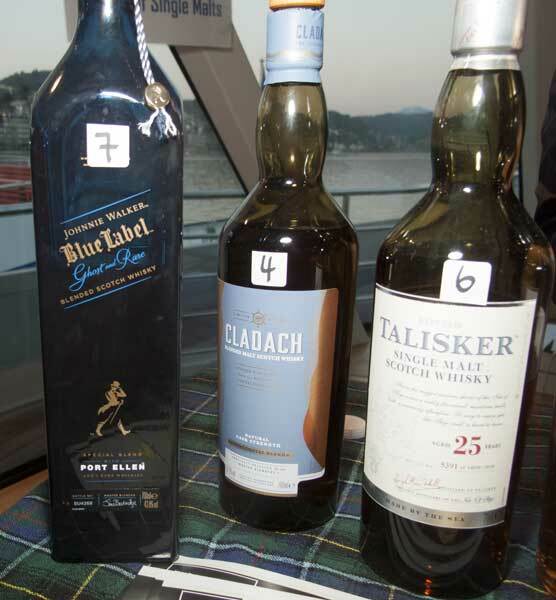 The whisky was intense, maritime, spicy, with nice round and moderately spicy red wine flavours. The second Octomore was a 11 YO Octomore wine matured. Much lighter in colour, it is matured in ex- Sauternes casks. The whisky tasted less peaty than the 2009. It is also sweeter, rounder and less spicy. The 2001 17 YO Port Charlotte was a very round expression of Port Charlotte, moderately peated, on seaweeds, sultanas, round tangerine flavours, cinnamon and soft spices. Rather gentle. 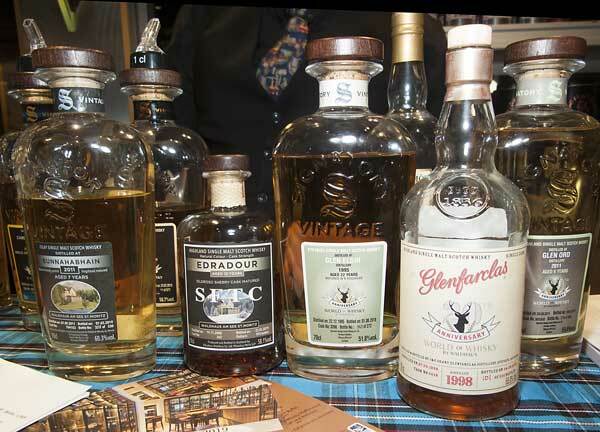 Just one meter further was the Whisky Schiff Luzern stand, with the special bottlings for this event from the previous years, as well as the new Caol Ila 11 YO for this edition. The Caol Ila was a very round and sweet sherry Caol Ila, very peaty, maritime, tarry, dried fruits and quite some rubber. On the other side of the boat, there was the joint stand of Charles Hofer and Angel’s share. I started there by tasting of few House of McCallum (a recent independent bottling company founded by the ex- Glengoyne distillery manager), the first one being the Mc Warrior, a very nice sweet, fruity and slightly spicy and aromatic Highland Single malt, matured approximately 5 years in ex-bourbon casks and approximately 2 years in ex-sherry casks. A nice drinking whisky. From the Vintage series, the 22 YO Ben Nevis finished in Virgin French oak casks was smooth, round, mellow, slightly spicy and winey. The Port flavours were well integrated in the 14 YO Bruichladdich, very round, smooth, slightly malty and maritime, with some sea brine, light sweet and dry winey flavours. The Ledaig 11 YO was a vatting of 2 casks. It was light, smooth, maritime, peaty to very peaty, with a nice complex and rather subtle maritime peat smoke. 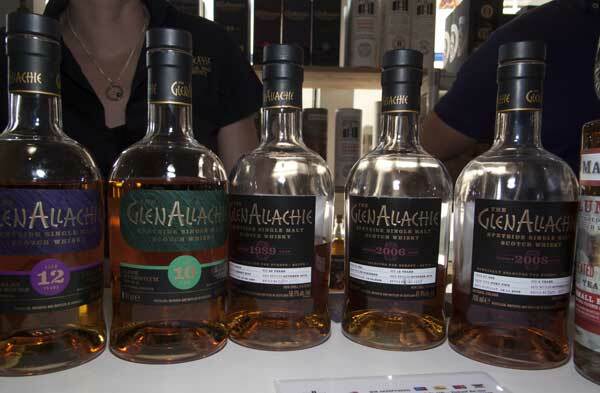 This was followed by the tasting of a duo of Glenallachie Single Casks for Europe Batch 1, a very nice, intense, spicy, floral, and complex 2006, with a dash of oaky spices. The 1989 was mellower, rounder, fruitier, markedly less spicy than the 2006, with more fruits, including exotic fruits. Very good. Finally, I tasted the 25 YO, a very good, mellow and complex Glenallachie, combining a mixture of floral, stewed fruits and honey flavours. A very nice one. 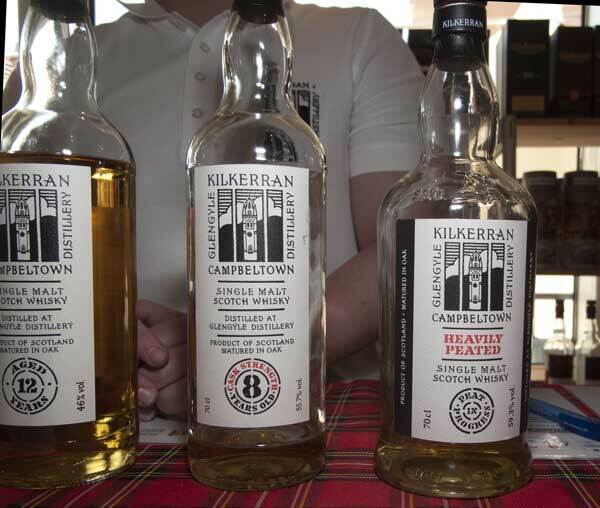 The Kilkerran Core range, including the new "Peat in Progress"
The Kilkerran Heavily Peated “Peat in Progress” had just arrived. It is very smooth and rather young, spicy, on a moderately aromatic peat smoke, sea brine, some oaky spices and leather. A mixture of 55% ex-bourbon and 45% ex-sherry casks. It is only 3 years old, and curious to taste more matured versions of this promising whisky. At The First Editions, I tried the 13 YO Inchfad Hepburn’s Choice, a heavily peated version of whisky distilled at Loch Lomond, with a rather strong aromatic peat smoke, vanilla, some floral and light grassy flavours. Acla was proposing bottles from Shinanoya that they have started recently to import. The Speyburn 2004 single cask was very good, intense, rich, with a sweet, but rather intense sherry influence, on sultanas, tangerine, orange, honey, exotic fruits and some cinnamon. Very good and juicy. The Tomatin 10 YO single cask was another good sherried single malt, more intense and spicier than the Speyburn, and less mellow. The 1997 Bablair Single Cask was a very complex whisky, well balanced, on honey, soft spices, melon, some guava, tangerine and other tropical fruits. Very enjoyable. The Bowmore 13 YO Old Malt Cask was very peaty and clean, with strong oaky flavours and some wet wood flavours. 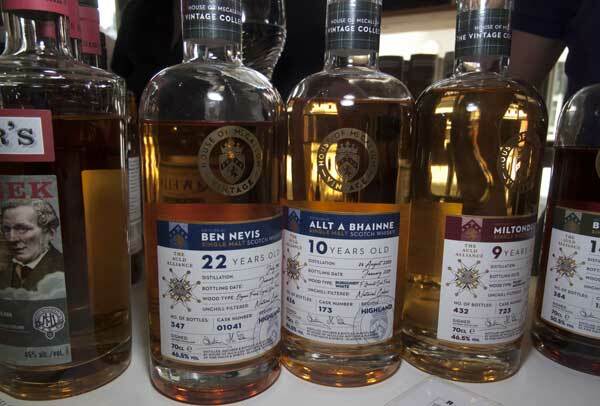 In addition to these single casks for Shinanoya, I tasted the Ben Nevis 1998 20 YO Snakes from Liquid Treasures, a sweet, sugary, smooth and slightly soft expression from that distillery. 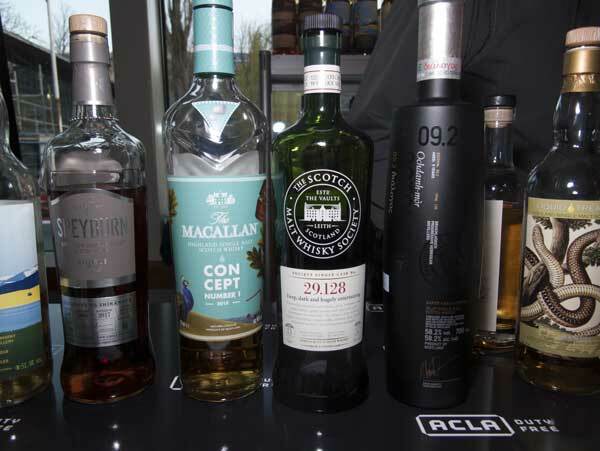 I could not resist tasting the Macallan Concept N°1-2018, the most recent expression of Macallan for Travel Retail. It is sweet, round, slightly spicy, on stewed fruits, honey and some cinnamon, with a rather round finish. Not much complexity, but an easy drinking whisky. It was then time to taste a very mellow, sweet, rich, slightly floral and spicy Royal Lochnagar 1971 Douglas Laing Platinum, with nice old and round sherry influence. The Laphroaig SMWS 29.128 was one of the best whiskies I tasted during the evening, with a complex and maritime peat smoke, nice round and sweet sherry flavours, giving a nice balanced and fruitiness to the whisky. The Octomore 9.2 for Travel Retail was matured partially in red wine casks. The whisky was very peaty, intense, rather matured for its age; with a nice spicy and red wine influence. Finally, I tasted the Viking Pride, the 18 YO Highland Park for Travel Retail. It was mellow, well balanced, sweet, and slightly smoky, on dried and stewed fruit, some orange, tangerine and sultanas. A pleasant surprise. 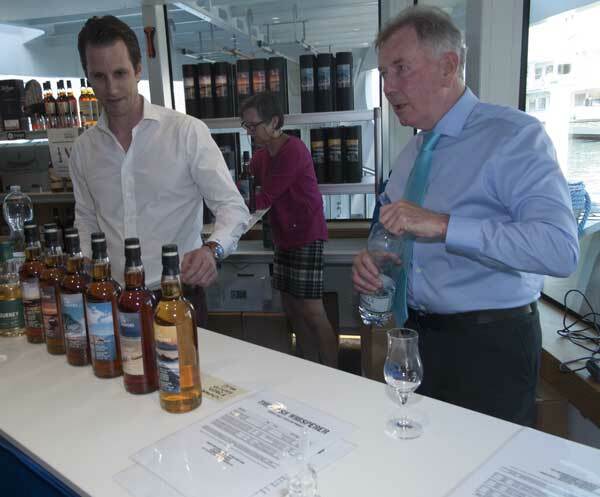 On the upper deck, at House of single Malts, a fair number of Diageo products were present, including the Johnnie Walker Port Ellen, a mellow to very mellow blended whisky, with a fair amount of grain whisky, and some maritime and peated flavours. One can taste the Port Ellen in this blend, but I do not think there are more a few % at most. We feel age in this blend, but it is rather smooth and not overly complex. At Alexanderweine, Schuller Keller, Fasstar and Happyness, I could not see any new whiskies or whisky that I have tried. 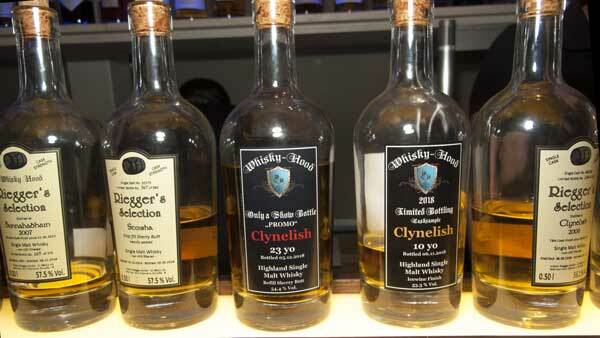 On the other hand, I saw several interesting whiskies at Whisky Hood. I started with a very good, sweet, fruity, waxy Clynelish 1995 bottled by Signatory for Whisky Hood, with nice juicy flavours of orange and tangerine, well integrated and not dominating the whisky. I tasted then The Peat Bog Sherry Cask fro the Whisky Cask, a nice oaky, spicy, maritime and peaty whisky, slightly young, but with nice sweet sherry flavours. The Whisky Cask Irish sherry was a very pleasant and very fruity whiskey, smooth, with lots of mango, exotic fruits and a solid body. One of the best young Irish whiskey I have tasted. I moved then to Awico to taste the new Whisky Chamber and Willy started by serving me a very elegant, complex, smooth and well balanced Tormore, rather subtle, slightly mellow and with soft spices. Limited to 30 bottles, I am not sure if it going to last long. Definitely worth a try! It was time then to taste the Lagavulin matured in quarter casks, the buai an diabhail of Islay, started with the intense, spicy, maritime, peaty and smoky Port cask, with the Port contributing to a nice sweetness to the whole. The Port is well integrated and not overwhelming. Very good! The Rum cask was quite different: it tasted less peaty and maritime, but smoother, sweeter and less peated as well. Two different but very good Lagavulin. Not everyday that one can taste a quarter cask Lagavulin! Finally, I tasted the Speyside Aingeal 10 YO. A very round, winey, slightly spicy Speyside single malt, on grapes, spices, light herbal and black berries. It is my first Glenfarclas matured at birth in a red wine (Amarone) cask. 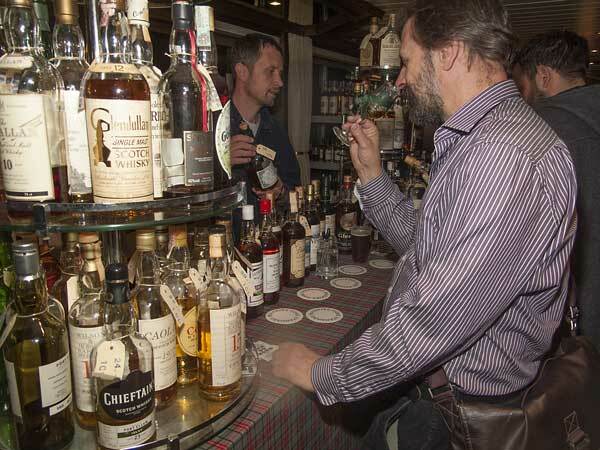 It was then time to visit world of whiskies and to taste their new whiskies. The first was a 1997 Imperial from Carn Mor for World of Whisky (WoW), a nice, mellow, delicate and sweet, almost sugary, whisky, with soft grassy flavours. The Dalmore 27 YO Carn Mor for WoW was a mellow, very complex and well balanced Dalmore, moderately, floral, spicy and grassy, with a rather heavy body and a most enjoyable whisky. I wish the Dalmore OB were of that quality. From Signatory, the Tomtintoul 1995 for WoW was a gentle, mellow, fruity and well balanced whisky, quite intense and very enjoyable too. The Edradour 2008 SFTC for WoW was a very good whisky rather heavily sherried whisky, intense, round, on mixture of juicy and dried fruits and a touch of spices. The sherry influence is strong to very strong, but flawless, without any rubbery flavours. From an excellent sherry cask. The Glenfarclas 1998 OB for WoW was a rather dry and grassy expression from that distillery. Not the most typical Glenfarclas, but well made. Moving to the peaty side, I tasted the Ardmore 2009 for the best 3 stat hotels of Switzerland, a slightly young, light and fresh single malt, moderately peated, and aromatic, with a nice elegant and subtle peat smoke. The last one at the stand was the new Bunnahabhain 7 YO Heavily Peated for WoW, a very intense and heavily peaty Bunna, well matured, maritime, with some salty and oily flavours. A nice one. As it was around 20, the ships were getting very busy and it was difficult to move. I managed to push my way through to the end of the deck, at the Bar du Nord in Carouge. They had several new arrival, including a 40 YO Linkwood for Sestante, including an old Balvenie “As we get it” 106 Proof. I will review this one later, as I only sampled it. The Tamnavulin 22 YO OB 45% was an excellent old style sherry Speyisde, with a light, but juicy and fruity sherry influence, and nice round floral flavours and some honey. Very good! The Blair Athol 80 Proof was a nice grassy, floral, round, slightly aromatic and bitter whisky, very different from the current style of the distillery. I concluded with the Glen Grant 25 YO for Mainardi bottled in the 1970s or early 1980: a very elegant, subtle, mellow and fruity Glen Grant, slightly peaty, with nice soft spices, dried and candied fruits. A lovely old style of Glen Grant. The Claxton's single malt at Glen Fahrn. At Glen Fahrn, I did not notice any bottlings, with the exception of the Claxton’s. I skipped it, not due to the lack of interest, on the contrary, but because I received in the morning a sample box of their new samples. I am very curious to taste them! 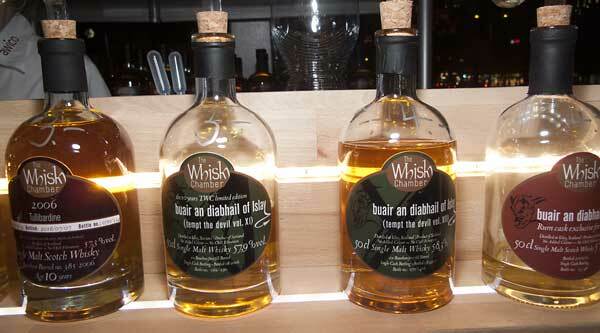 They had also many Duncan Taylor and I noticed several new grain whiskies. Murray McDavid was so popular, that I could not approach them. As exhaustion was coming, I made my final stop at Ramseyer’s Whisky connection to taste a very good, rich, intense, floral and rather complex Aberlour 12 from the Maltbarn. Bottled at cask strength from a bourbon cask, it was really nice to taste a non-sherried Aberlour. Bourbon version of Aberlour should not be underestimated. The Glenrothes 22 YO from Maltbarn was a sharp contrast to the Aberlour: it was mellow, slightly soft, with soft spices, rather smooth, with some tobacco and light fruity flavours. 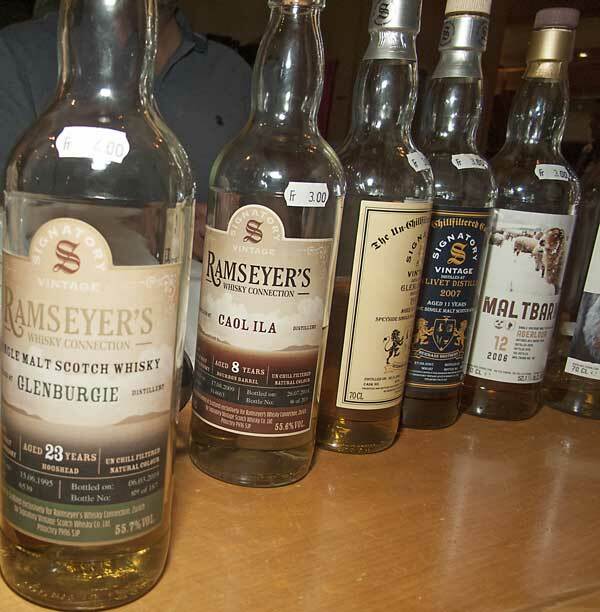 I enjoyed better the Glenburgie 23 YO bottled for Ramseyer, a very nice, complex, intense, moderately floral and grassy whisky, with a remarkable balance and soft spices. A good value whisky. Thank you Markus. With that, it was time to take the train home. 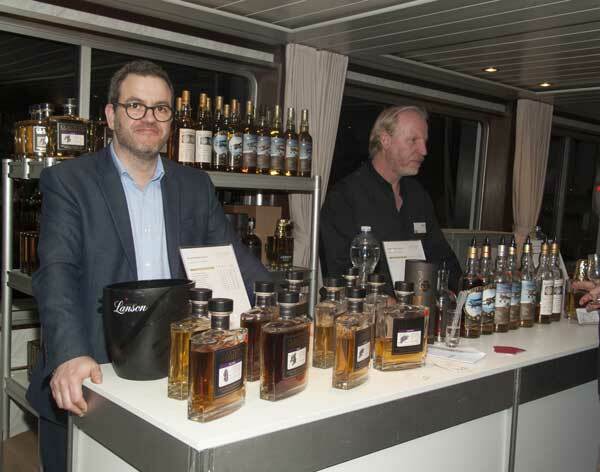 I had a very enjoyable whisky fair at Luzern and the new ship, Diamant, was very pleasant, as it was broader to move around than the others. At the start of the evening, it was getting crowded. In one ship, on the deck where the Trésor du Chai was located, they blocked one access, so it is was almost impossible to go through. I gave up on that section. My only complain was the limited number of spittoons available.